The Concertto Cable Management is a complete solution for bridging the gap between our award winning Table Boxes to our full line of Floor Boxes and Poke-Thru solutions. 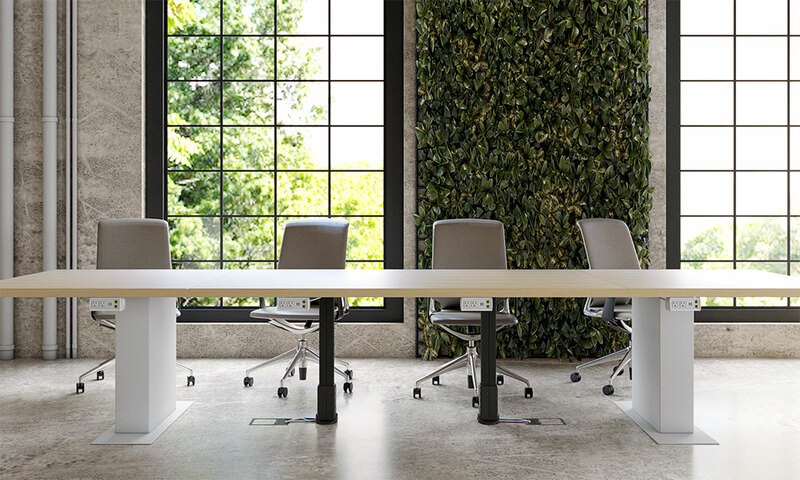 This system provides a clean, elegant cable management solution in table designs that lack a pedestal for hiding cables and power as they transition from the tables boxes to the floor. The Concertto Cable Management (WM-CMPT) consists of an under table channel for dressing cables horizontally along the table underside. 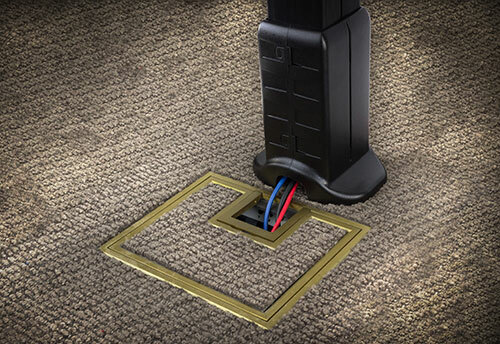 The WM-CP cable pathway provides an easily integrated solution for handling multiple low-voltage AV/Data and AC cables from the table's underside to the floor. The WM-LC leg channel is also available for dressing cables along the backside of a round table leg. Concertto Cable Management transitioning from our under table Symphony line to our floor boxes. 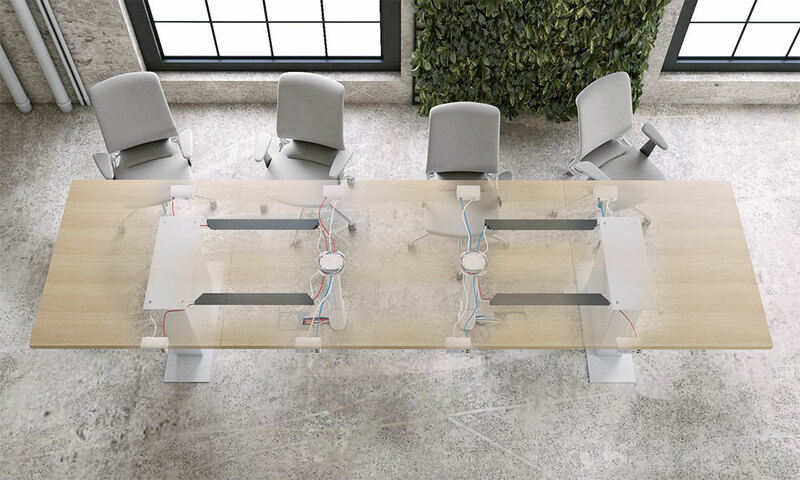 The Concertto Cable Management system consists of an under table channel for dressing cables horizontally along the table underside. The WM-CP cable pathway provides an easily integrated solution for handling multiple low-voltage AV/Data and AC cables from the table's underside to the floor. The cable pathway opens easily to allow additional low-voltage or AC cables each in their own divided section. The top of the cable pathway has a built-in service loop storage area to dress excess cable. The bottom is a boot that provides easy cable egress while holding the cable pathway in place. The WM-UTC under table channel is used for dressing cables horizontally along the table underside. Its unique shape and rubber like edge allows cables to enter and exit the channel at any point along its length. Each 22.5” track has mitered ends to create square corners or allow cables to pass into the cable pathway. For longer custom installations, the 5’ long WM-UTC5 is available. 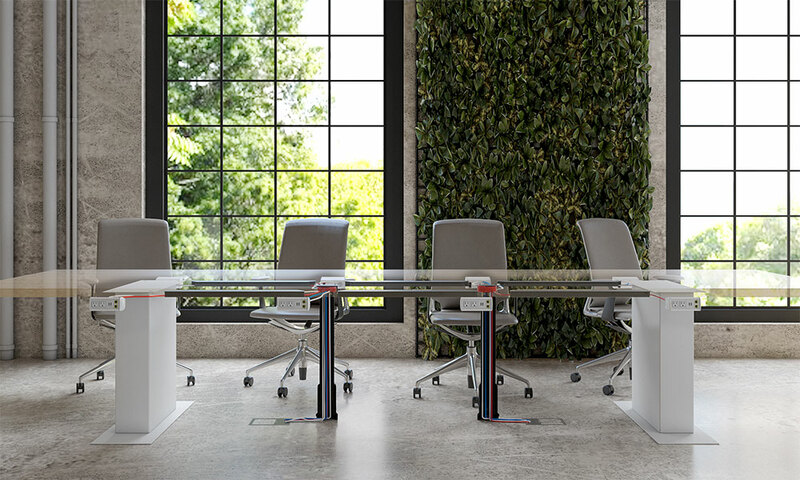 The WM-CP cable pathway provides a 25” to 30” adjustable height pathway from the underside of the table to the floor. It handles multiple low-voltage AV/Data and AC cables. The cable pathway opens easily to allow additional low-voltage or AC cables each in their own divided section. The top of the cable pathway has a built-in service loop storage area to dress excess cable. The bottom is a boot that provides easy cable egress while holding the cable pathway in place. The WM-LC is a semi-circular cable channel designed to attach to round table legs for applications when the cable pathway is not applicable. Each WM-LC has 3 strips of double sided tape pre-attached for easy installation.